ON A COLD DECEMBER NIGHT, I stepped to the front of a room full of people at The Sketchnote Handbook launch party, amazed to see the turnout for my book. 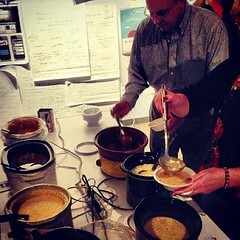 In the back of the room, a table was lined with crock pots of soup (Aga Artka's Pickle Soup was a hit), fresh bread, Milwaukee Brewing Company beer, water and sweet treats. 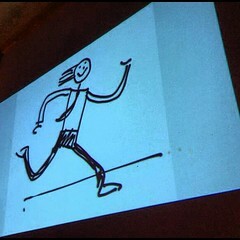 At the front of the room, I and Len Kendall presented an evening of sketchnoting fun for 60+ people at Translator. After an hour of mingling and signing books, I kicked off the evening with words of welcome and a brief drawing lesson for the crowd. Len Kendall took the floor after me, sharing his story of using social media to propose to his girlfriend Katie. Many captured sketchnotes while Len presented. 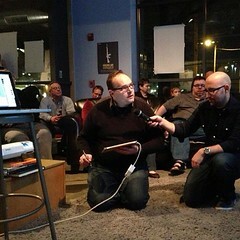 We ended the night having volunteers come up to share their sketchnotes with the group, using my connected iPad as a document camera. It was great fun for everyone on Thursday night. Thank you Mark, Cindi and Katie at Translator for making everything so easy. I think this preview shows why The Video Edition is a great value. 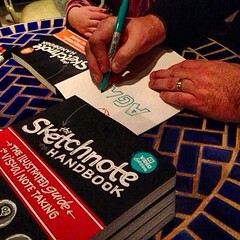 The Sketchnote Handbook is being very well received. I've read many positive tweets from those who have received a copy as Amazon began shipping their stock on Friday. The book printing and paper have exceeded my expectations, and I think readers notice those details too. It's exciting! There have been a bunch of great interviews, articles and podcasts around the book launch, so I've gathered those here in one convenient place. Eventually I'll create a press page for the book where media mentions will live. I speak with Myke Hurley about sketchnoting and the new book. I talk with Nancy Runzel, of Peachpit Press about my book and writing process. I really want to read @rohdesign's new Sketchnote Handbook -- but my kids took it and now they won't stop drawing. @rohdesign Amazon image for your book does NOT do it justice. Wow, it’s lovely. Color and artifacts suffer on web. This week I found that the Kindle Edition of the book has a swath of blank pages, right in the middle of the book. I've alerted Peachpit and there is a new version being pushed out to Amazon, so if you get this edition, hold on for the updated document coming soon before canceling or leaving reviews. Love it? Leave an Amazon Review! If you have a copy of the book and you love it, the most valuable action you can take for me and the book is to leave an Amazon review. It can be brief - just 5-10 minutes does the trick. Reviews help amazon determine popularity and drives more book sales. So, go review the book! I am super excited for Amazon Germany to finally get me my delivery. Great! Please let me know when yours arrives so other German buyers roughly know the shipping timeframes. Do you know if the Kindle version has been fixed? I can't wait to get my hands on it. As I understand it, purchasers of the Kindle edition will receive an update notice. I have not yet received mine as of this writing, but when I do and can verify the update I will announce that information. I sure hope it comes in soon. Can I still get a pdf version through peach pit? It's a week after your note about the problem with the kindle edition's blank pages. I just bought the book, not realizing it would have this problem. When will this be fixed? If it's not ready within a few days of the discovery, what's to convince me that it will be within a few weeks? This isn't a hard problem to fix. Steve - I'm so sorry for these hassles. What I'm hearing from Amazon is the Kindle version of the book is having issues with the Kindle iPad app. I have verified this. I was able to get the book working properly on the Mac Kindle reader, though I haven't heard reports from Kindle Fire or Kindle Fire HD owners. You have to understand that this issue is beyond my control to fix. I can report what I see and request the fix - but I'm not the one making the fixes, Peachpit and Amazon are. Believe me, this is frustrating - I wish I had more control. I'm hoping it will be within a week, but can't promise anything, not being the one making fixes. One option would be the PDF version from Peachpit - it's the same as the Kindle document except it embeds your name as a watermark, rather than Amazon Kindle DRM being wrapped around the PDF. I will announce the Kindle update here once it has been verified by me. Any luck on the republishing/republication of your book to the Kindle for iPad? I would like to purchase it in that format, but don't want the frustration of going through blank pages again. December 29, 2012 | Steve G.
Steve, no word. I think the production departments closed down for the holidays. I do see the Kindle version as been taken down while they sort it out, but I don't have a timeline on this for you. As soon as I know something I will definitely post on the site.